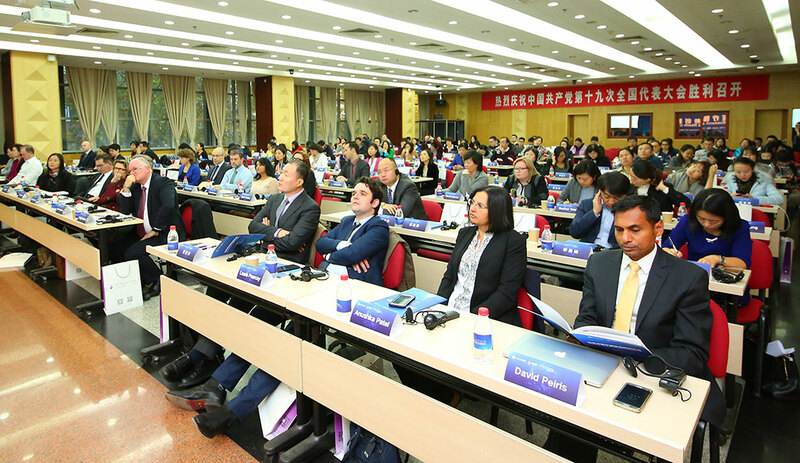 On 3 November 2017, on the 10th anniversary of the establishment of The George Institute, China (GI China), a symposium entitled ‘Innovations in Research and Health Care’ was successfully held in Beijing, organized by Peking University Health Science Center (PUHSC) and UNSW Sydney, with the technical support of GI China. Professors Qiudan Sun, Director of Office of International Cooperation, PUHSC; Zhijie Zheng, Chair of Department of Global Health, PUHSC; Ian Jacobs, President and Vice-Chancellor of UNSW; Robyn Norton and Stephen MacMahon, Co-Principal Directors, and Anushka Patel, Chief Scientist of GI Globally; Craig Anderson and Puhong Zhang, Executive Director and Associate Director of GI China, participated by delivering key addresses. 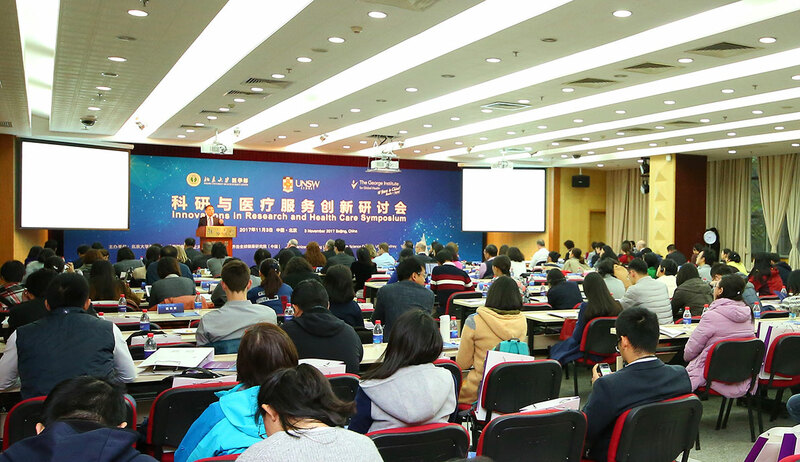 Over 200 attendees including renowned experts, scholars, industry delegates, media representatives and delegates from Peking University, UNSW Sydney and Oxford University, Duke Kunshan University, University of Sydney, and Tsinghua University, joined in the meeting and contributed to the warm and interactive discussion. Prof. Sun opened the symposium by extending her warm welcome to participants, and highlighting the strong cooperative relationship between PUHSC and GI China over the last decade. This relationship has included academic exchange through scientific research, professional training, and capacity development, leading to an increase in the overall level of collaboration, communication, and exchange between Chinese and Australian scientists, fruitful research outputs. She hoped collaborative foundation will be extended towards even greater contributions to the health of Chinese people and across the globe. Prof. Robyn Norton spoke highly of recent innovative work and accomplishments in health care, whilst also emphasizing the modern demands for innovation in the sector. In particular, innovation in healthcare related to non-communicable diseases (NCDs) is, in her opinion, of major significance, even imperative. She highlighted that “in spite of the remarkable achievements in health, the burden of NCDs is severe and increasing globally, that requires urgent measures to address”. Prof. Ian Jacobs appreciated the opportunities that a close collaborative relationship between the three organizations could achieve within the expanding economic and technical innovative growth in China. “At the heart of innovation lies collaboration,” he said, “the sort of collaboration that drives knowledge and exchange, and that innovation, in return, drives the improvement of people’s health outcomes and quality of lives.” He sincerely hoped the partnerships and close cooperative relationships will continue to have enormous opportunities to produce abundant innovative results to tackle urgent health issues. Prof. Craig Anderson expressed his amazement with the research achievements that had been presented at the symposium. He believed that big data analytical opportunities and developments in mobile health technologies will provide affordable and sustainable health interventions that could be applied to improve community health care management to avoid tens of thousands of premature death and disability across China. During the symposium, experts in fields of clinical medicine, mobile health and health economics were actively engaged in keynote lectures on reducing major health burdens, profiling latest progress in clinical trials, eHealth and big data opportunities.